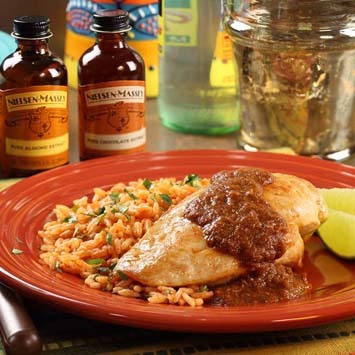 Fiesta Mole Sauce (see recipe below), made with Nielsen-Massey Pure Chocolate and Pure Almond Extracts, is surprisingly simple for home cooks of all skill levels, while wowing guests. Serve it over shredded chicken and create Fiesta Mole Tacos that, when topped with two orange-infused extras, will leave your friends begging for doggy bags. This is a guest-post recipe that's courtesy of Nielsen-Massey. The recipe will make 4 servings. Heat the oil in a medium-sized frying pan and add the chile, garlic and onion. Saute until the mixture is fragrant and the onion is translucent. Cool slightly and add to a blender. Blend until smooth. Return the mixture to the pan and add the remaining ingredients and cook, stirring occasionally 30 minutes. Use the mixture to top grilled baked or shredded chicken or turkey. I have just started to use Nielsen-Massey extracts in savory dishes. I do like how they add something extra to the taste.